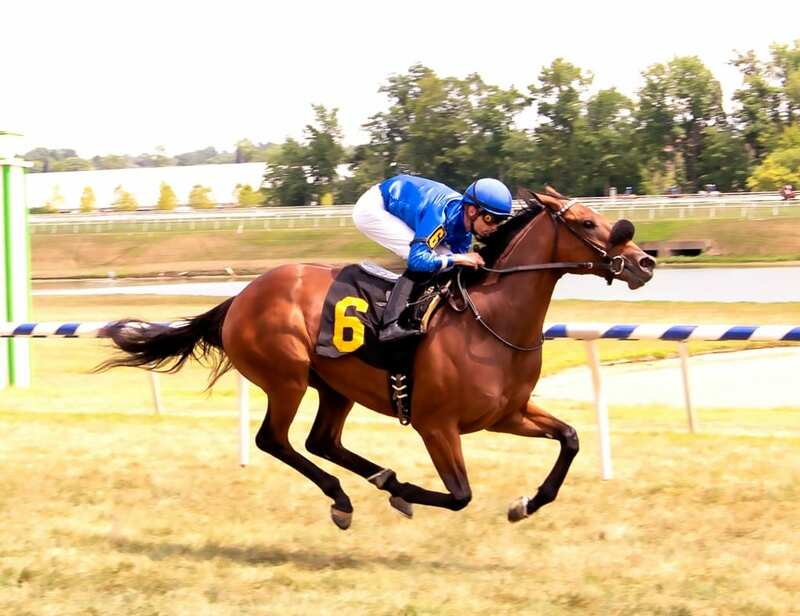 A dominant winner over the course in her debut two months ago, Godolphin homebred Elsa returns as the horse to beat as she seeks her first career stakes victory in Saturday’s $100,000 Selima at Laurel Park. The 89th running of the Selima 2-year-old fillies and 92nd running of the $100,000 Laurel Futurity, presented by B&B Commercial Interiors, for 2-year-olds both at six furlongs, are among six stakes over Laurel’s world-class turf course that complement the 27th renewal of the $250,000 Xpressbet Frank J. De Francis Memorial Dash (G3) on a 13-race Fall Festival of Racing program. All seven stakes, worth $900,000 in purses, were rescheduled from Sept. 15 due to the threat of severe weather from Hurricane Florence. First race post time Saturday is 12:30 p.m.
A juvenile daughter of 2011 Kentucky Derby (G1) winner Animal Kingdom, Elsa rated in third in her July 20 unveiling at Laurel before taking over at the top of the stretch and drawing away to a 3 ¾-length triumph under jockey Sheldon Russell, who gets the return call from Post 6 in a field of 12. She is favored at 9-5 on the morning line. Stidham shipped Elsa to Saratoga for the Bolton Landing Stakes Aug. 15, like her debut race also run at 5 ½ furlongs on the grass. She found herself ahead of only one horse after a half-mile, just two lengths off the lead, and wound up third as the favorite, beaten two lengths. Elsa and Margie Is Livid, third in the off-the-turf Colleen Stakes Aug. 4 at Monmouth Park, are the only two fillies in the field with a win over Laurel’s turf course. Little Miss Raelyn, Helen and also-eligible Questionoftheday have all been successful over the main track. Chris Larsen’s Andarta enters the Selima off a front-running three-quarter-length maiden triumph going 5 ½ on the Saratoga turf Aug. 16. It was the second start for the New York-bred, who led from the gate to the stretch before fading to fifth in her July 20 debut, also at the Spa. “She was very impressive in breaking her maiden. She’s got a lot of early speed and with a filly like her there’s not a lot of places to go with her,” trainer Tom Albertrani said. “This looked like a good possibility to come back and try her here. I think distance shouldn’t be a problem. Edwin Gonzalez is named to ride the narrow third program choice at 9-2 from Post 1. All horses will carry 120 pounds. Just a Whim, fifth in the one-mile Sorority on turf Sept. 1 at Monmouth; Creedibility, fourth in the Colleen; and Questionoftheday, sixth in the My Dear Stakes over Woodbine’s synthetic surface July 7, also have stakes experience. Surge of Pride, Shoobiedoobydoo, Monkeys Uncle and Jazzy J complete the field.